Exterior color, Daytona Sunset Orange (71U) is being discontinued as an available color selection for the 2006 Corvette and Z06. Saturday, April 1, 2006 will be the final DOSP cycle available for Daytona Sunset Orange placement. A replacement color will be introduced for the start of the 2007 model year. New CORSA's for your Z06!!! Incredible sound! steel performance exhaust systems offering increased horsepower and torque for both C6 and Z06 Corvette owners. “The Z06 comes stock from the factory with 3-inch pipes but a 2 ½-inch inlet muffler, while the standard C6 has a 2 ½-inch pipe and muffler. Our systems are 3-inchs, all the way,” said Michael Schwartz, chief business officer, CORSA Performance. “This design unlocks even more of the Z06’s already impressive performance potential for up to 10 additional horsepower and 14 lb/ft. of torque, while still providing the distinctive CORSA sound for the Corvette’s race-bred 427-cubic inch displacement engine. CLICK HERE for more information and dyno test sheet. The registry has learned GM sent a "Product Action Announcement" to dealers today warning of a Clutch issue on 913 2006 Corvettes equipped with manual transmissions. General Motors is announcing Customer Satisfaction Program 06523 today. The total number of vehicles involved is 913. This program will be administered in two phases. Customer notification letter mailing for Phase 1 will begin on April 3, 2006. Customer notification letter mailing for Phase 2 will begin on April 13, 2006. CLICK HERE for full announcement. Seven-time Tour de France champion Lance Armstrong will be the pace car driver for this year's Indianapolis 500, TV station WRTV reported Tuesday, citing sources it did not name. To date, No official announcement regarding the pace car driver for this year's race has been made. Armstrong, who has retired from cycling, has more Tour de France titles than anyone. Those victories came after he battled testicular cancer, for which he was treated by Indiana University doctors in Indianapolis in 1997. The Indy 500 is scheduled to take place May 28. 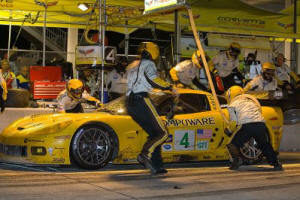 Corvette Racing Wins Sebring 12-Hour Race! Corvette Racing success last resulted in having 125 extra pounds added to the cars, but even so....Corvette Racing celebrates a victory in the Mobil 1 Twelve Hours of Sebring. The No. 4 Compuware Corvette C6-R driven by Oliver Gavin, Olivier Beretta and Jan Magnussen ran like clockwork throughout the 12-hour endurance race, finishing first in the GT1 class and third overall with a one-lap margin of victory over their rivals in the No. 009 Aston Martin DBR9. 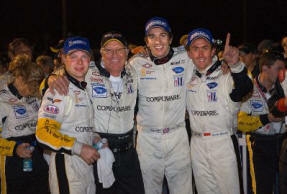 Ron Fellows, Johnny O'Connell and Max Papis finished fourth in the GT1 division and seventh overall in the No. 3 Compuware Corvette C6-R following a hard-fought battle with the No. 007 Aston Martin in the closing laps. At the halfway point of the Mobil 1 Twelve Hours of Sebring, Corvette Racing's twin C6.R race cars were running first and second in the GT1 class and fourth and fifth overall. Then one minute into the second half of the 12-hour race, the No. 3 Compuware Corvette went to the paddock with a gearbox problem. The No. 3 Corvette Racing crew replaced the gears in the transaxle. Fellows was back in the car at 6:27 into the race, the engine was started at 6:29, and the car drove out of the paddock at 6:31 to a standing ovation by several hundred spectators who had gathered at the Corvette Racing transporter. Congratulations on a GREAT Win - CORVETTE RACING ! Sizing up the Competition - Adapted from "Performance Press"
For 2006, the Corvette and the XLR have been placed in the Midsize Premium Sporty segment for the annual J.D. Power survey, with vehicles such as the Dodge Viper, Lexus SC 430, Maserati Coupe/ Spyder, Mercedes Benz SL-Class, and Porsche 911. These vehicles present stiff competition for the Corvette and the XLR. Several changes have been made to the segment. For first time, the Corvette and XLR are competing in the same segment, and the Nissan 350Z is no longer a J.D. Power competitor with Corvette. Over the next few weeks we will attempt to profile the competitors. The first will be the Porsche 911. According to J.D. Power, the Porsche 911 and the Corvette are tied in the overall rating and performance categories. This German made automobile is rated higher in areas such as body, interior quality, and style. The Corvette exceeds the Porsche 911 in comfort and overall appeal. 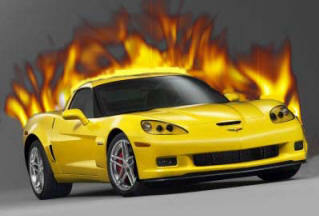 In 2005, the Corvette scored 100 PPH in initial quality, whereas the Porsche 911 scored 85 PPH. The Cadillac XLR rated the same as the Porsche 911 in comfort, style, and overall appeal. Corvette Racing's championship-winning Corvette C6.R race car has been named the "North American Car of the Year" by dailysportscar.com, a noted online magazine that provides in-depth coverage of sports car and GT series worldwide. In announcing the selection of the Corvette C6.R over marques such as Audi, Aston Martin and Maserati, the editors wrote, "The two yellow missiles utterly dominated proceedings in GT1. They were nothing short of world class throughout the year, taking ALMS and Le Mans titles at the first attempt - how many more might follow?" What an exciting article by our own Walt Thurn in the April 2006 Vette Magazine, pages 67-71 covering the Registry's Le Mans Trip of a Lifetime to Europe. Walt has some fabulous photos that you may not have seen as well as a wonderful chronicle of the Le Mans travelers. Many Corvette owners fantasize about driving their cars in Europe, but that rarely happens in real life. But in this case, the fantasy came true. If you are not a subscriber, be sure to pick a copy of this issue. Thanks, Walt, for getting the word out there about the Registry! Electronic Column Lock System Fix! IMPORTANT for C5 Owners! Some customers of 1997-2004 Chevrolet Corvettes equipped with a manual transmission (MM6/M12); 1997-2000 Chevrolet Export Corvettes equipped with an automatic transmission; and 2001-2004 Chevrolet European Export Corvettes equipped with an automatic transmission may have a condition where the column lock may fail to unlock the steering column when the vehicle is started. This Special Policy covers the condition described above until February 29, 2008, regardless of ownership. The repairs will be made at no charge to the customer. For vehicles covered by Vehicle Service Contracts, all eligible claims with repair orders on or after February 8, 2006, are covered by this special policy and must be submitted using the labor operation codes provided with this bulletin. Claims with repair orders prior to February 8, 2006, must be submitted to the Service Contract provider. That’s the BIG news all over the Corvette Kingdom! Members, the SAGA CONTINUES…the latest version of this ever breaking story goes like this: Amcast Industrial Corporation, the sole producer of C6 and Z06 production Corvette wheels filed for bankruptcy, as we all know, late last year. Chevrolet filed an injunction with the Indiana Courts asking them to make Amcast Corp continue with their original pricing agreement and production schedule regarding Corvette wheels. Wheel issues and new paint color. Back on December 3rd we posted ( First on the Internet mind you ) of the problems with wheel maker Amcast. We've all been worried about delays, production, options, ect. Next week, we will have a more detailed account for you but.. for now, here is the latest. Some concessions have been made, and GM is doing it's best but: On vehicles that were/are produced after January 3, 2006, there will be not polished wheels available for Corvette, silver painted wheels will be the offering. There is an indefinite hold on the chrome wheel. The plant is going to do it's best to get the Corvette you ordered out the door, however, when you place an order the dealer may tell you that you are getting a certain wheel option, but in fact the dealer won't know until the car arrives at the dealership. All substitutions of a lower cost wheel will be reflected in a reduced vehicle price. The production effects and impact on Z06 are still undetermined. There has been talk of a new color next year..."Atomic Orange".. We are told this color is still being considered, and is not yet a sure thing.. If it does happen, it will be an optional cost tint color in the Monterey Red and Velocity Yellow range. Most of us had a Camaro at one time or another, and we loved them! Now, designed by Tom Peters, designer or the Corvette C6, combining dramatic design and exciting performance, the Chevrolet Camaro Concept recaptures the spirit of one of the most popular sport coupes of all time and redefines the Camaro for new generations of fans. 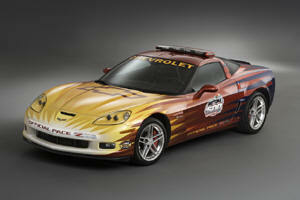 A specially outfitted 2006 Corvette Z06 will serve as the official pace car of the 48th running of the Daytona 500, on Feb. 19. "Tonight Show" host and auto enthusiast Jay Leno will drive the pace car. The Daytona 500 is NASCAR’s premier race and traditionally kicks off the Nextel Cup racing season. Selection of the Z06 model marks the second consecutive year that a Corvette has been selected as the Daytona 500 pace car. Interestingly, the Corvette Z06’s 505-horsepower output is actually more than the power produced by the race cars that will compete in the Daytona 500 – a first for a pace car. This is because of the unique "restrictor plate" rule established for the Daytona and Talladega , Ala. racetracks. On these 2.5-mile-long super speedways, the restrictor plate reduces airflow into the engine to limit horsepower and keep race car speeds below 200 mph. With a restrictor plate, racing engine power is reduced from about 750 horsepower to about 450 horsepower. Race cars can still average more than 190 mph on Daytona’s long straights. The Corvette Z06 Daytona 500 wears a unique paint scheme, inspired by the hot-to-cool color transition of a space capsule entering Earth’s atmosphere at a high rate of speed. The paint scheme is carried out with an elaborate, interlocking scallops design – a twist on hot rod-style flames – that blends "hot" Lemon Drop yellow at the nose of the Corvette with Lemon Glow, Amber Ecstasy, Blazing Copper and Hot Poppy. The colors culminate with a cool Sapphire Trance blue color at the rear of the vehicle. DuPont, the sponsor of Jeff Gordon’s No. 24 Monte Carlo, supplied the colors, which are from the company’s "Hot Hues" line of automotive paint. "As if the Corvette Z06 needed help in looking fast, the intricate paintwork of the pace car gives it the appearance of tremendous speed," said Peper. "It is one of the most elaborate and stunning vehicle designs we’ve created." Leno behind the wheel Jay Leno, host of the "Tonight Show" and an unabashed auto enthusiast, will drive the Corvette Z06 during opening ceremonies and the pace laps that start the race. Leno, who has a large collection of vintage automobiles and motorcycles, has previous experience as a pace car driver. Chevrolet returns to the Daytona 500 with 18 victories – the most of any manufacturer – including last year’s champion Jeff Gordon. Chevrolet also returns as the defending manufacturer’s cup champion, an award that has been bestowed 29 times. Also, defending Nextel Cup champion Tony Stewart drives the No. 20 Chevrolet Monte Carlo for Joe Gibbs Racing. CLICK HERE to download windows background image.